Vera Marie Marsh - 85, Little Bass River passed away peacefully on Thursday November 15, 2018 in Colchester East Hants Health Centre, Truro. 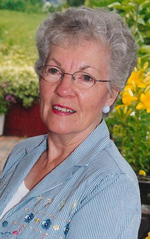 Born in Tupperville Ontario, Vera had lived in Nova Scotia since 1962 and left city life in Dartmouth to retire with her husband Chet in 1995. She is predeceased by her parents Walter and Maisie Harvey, sister Lois Boreskie and brother Roger Harvey. Vera’s ‘community’ wherever she lived included her immediate family, close neighbours and church family. Referred to as ‘a wonderful lady’, Vera was a caring friend and until frailty overtook, a faithful volunteer. Laughter and music were constants and she participated joyfully in many choirs and choral groups. Vera is survived by her adoring husband of 66 years, Chester, in Little Bass River; sister Janice Fathers (Ron) near Collingwood, Ontario; son Wayne (Gail) of Enfield and daughter Catherine Smith (Brian) in Carrs Brook; grandsons Jeffrey Smith of Halifax, Jeremy Marsh (Sarah) of Fall River, Tim Marsh (Julie) of Wellington; and David Marsh of Bedford; and by three great grandsons, Ben, Aaron and Luke Marsh of Fall River. A funeral service will be held Wednesday, November 21 at 2pm in Faith Baptist Church, 38 Station Rd., Great Village, with Pastor Steve Adams officiating. Reception will follow the service in fellowship hall.